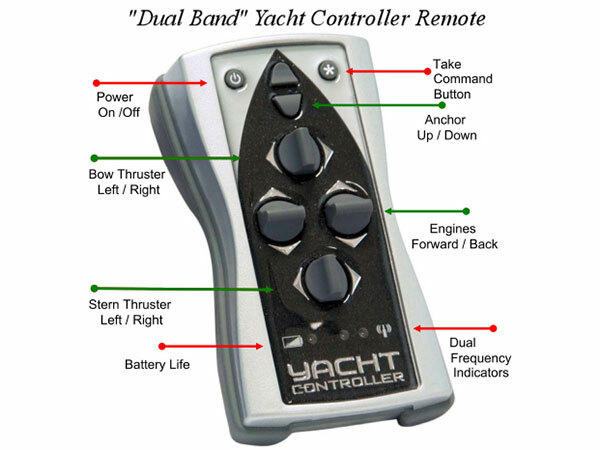 Burr Yacht Sales is now offering the installation of the Yacht Controller “Dual Band” device for new Flemings and as a Fleming retrofit option. Despite Fleming’s innate ease of operation, the practicality of a Yacht Controller device can be a welcome addition to any owner’s repertoire. Acting as an additional control station along with being wirelessly mobile gives Fleming owners added piece of mind when it comes to maneuvering and docking their yacht. Featuring engine controls, thruster controls, and even anchor controls on a slim remote; you are capable of initiating commands from anywhere on the vessel. This becomes especially useful when pulling into a slip and handling lines, allowing for adjustments with the engines or thrusters from anywhere on or even off board. Anchoring scenarios also become more manageable for a single person with the ability to be at the foredeck while maneuvering the boat and activating the windlass with the wireless remote. Call at 410-798-5900 or email us here for pricing and more information.